May one dip the tips of the Tzitzis in glue? Yes. This applies even to those who are particular not to make knots at the ends of the strings. May one glue the top knots of the Tzitzis in order to prevent it from opening? Yes. However some question whether doing so can consider the knot invalid. Purchase Tzitzis strings under a reliable Kashrus supervision. Separate three normal length strings and one long string. Some are accustomed to begin with the front corners of the Tzitzis. Say “Lesheim Mitzvas Tzitzis” prior to entering the strings into the hole. Some repeat this statement throughout the tying and between corners. Enter all four strings simultaneously into the hole. Even out the strings so they are of equal length on both sides, aside for the long string which remains longer on one side. The Tzitzis is to be tied to the side of the corner which will not be facing the floor while worn, in order to ensure that the braid of the Tzitzis hits the corner. Make a sign [loop] on the Tzitzis of one side in order to keep them on the same side throughout the tying. Begin to make the loops and knots. The loops may be made in any direction-right to left or left to right. Make a distance between each group of 3, 3, 1 in order so all the four sets are of equal space. Some are particular that each set is a space of exactly 2 cm. Make a smaller distance between each group of 2, 3, 3 in order so all the four sets are of equal space. Some are particular that each set is a space of exactly 2 cm. Make a smaller distance between each group of 3,3,3,2 in order so all the four sets are of equal space. Some are particular that each set is a space of exactly 2 cm. Make a smaller distance between each group of 1, 3, 3, 3, 3 in order so all the four sets are of equal space. Some are particular that each set is a space of exactly 2 cm. First custom in Admur; Michaber 11/14; Rama 11/3; The Kaf Hachaim 11/13 brings from the Arizal that there is no need to refrain from doing so. 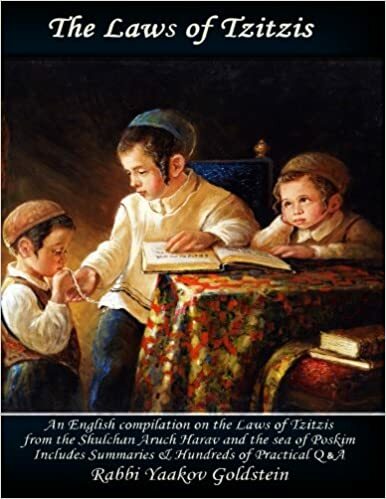 The Mishnes Chassidim Tzitzis 2/8 writes that this should be done. Sefer Baal Shem Al Hatorah brings from Rav Pinchus Mikoreitz that it should be done to all the strings the day after tying them, in order so there be a total of 72 knots. The Sheveit Haleivi 10/8 is lenient if the strings will unwind. A single string tore-Is my Tzitzis still Kosher?